Unlike UTs like Puducherry, Delhi has been given powers by the Constitution and its powers are not a "gift from Parliament," said Senior advocate Rajeev Dhavan, appearing for Kejriwal government. 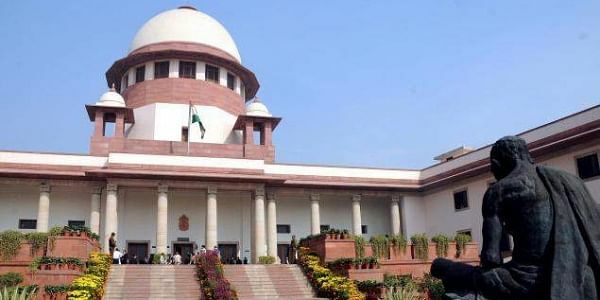 NEW DELHI: The Supreme Court today said the Constitution provided restrictions on legislative powers of the Union Territory of Delhi amid claims of the AAP government that Parliament's power to override legislative authority of the states was an "emergency" power. A five-judge Constitution bench headed by Chief Justice Dipak Misra, which is hearing pleas on who enjoys supremacy in governing the national capital, referred to Article 239AA and said though the Delhi Assembly has the power to legislate on certain subjects under state and concurrent lists while Parliament also has the power to legislate with respect to "any matter" of the Union Territory of Delhi. "There are restrictions on the power of the Delhi Assembly to legislate," the bench, also comprising Justices A K Sikri, A M Khanwilkar, D Y Chandrachud and Ashok Bhushan, said. Senior advocate Rajeev Dhavan, appearing for the Arvind Kejriwal government, said Parliament has the power to override Delhi Assembly, but this is the "emergency legislative power". Unlike UTs like Puducherry, Delhi has been given powers by the Constitution and its powers are not a "gift from Parliament", he said, adding that the constitutional provisions provided that the Delhi assembly "shall have the power to make laws on some subjects under state list and on all subjects under the concurrent list". The senior lawyer referred to other constitutional schemes and said that if there was no exclusivity attached to a subject, Parliament would have the power to make laws and if a subject fell under the exclusive domain of the states, the Union government could not the have the legislative powers. The bench said that with regard to Delhi's legislative powers, the state and concurrent lists have been merged into one where the state and Union both have legislative powers. "Does it not mean that more powers have been conferred on Parliament," the bench asked. Parliament has been given overriding powers under Article 239AA so that it was not "helpless if the state Assembly passes a ridiculous law", Dhavan said. He said that Delhi has a "responsible government" and not a "representative government" like Puducherry as it derived power from the Constitution. On the issue of limitations on Delhi's legislative and executive powers, the senior lawyer said that there were restrictions on powers of the Centre and states as well and "the question is are these limitations are so wide? The answer is no". He then referred to powers conferred on Panchayats and said, "If a government has to act purely on the basis of law then a government cannot govern...executive power rides with the legislative power." Every executive function and power cannot be provided in law, he said, adding that the elected chief minister has executive powers. The bench said the issue was on a narrow compass as to what could happen in case of difference of opinion between the lieutenant governor and the chief minister and the council of ministers. It also said that as far as the legislative arena was concerned there was no dispute on the powers of the Centre and Delhi government. Dhavan said, "The court will have to decide who (Delhi or the Centre) has the primary executive powers." The arguments remained inconclusive and would resume on November 21. Earlier, the apex court had raised a question whether the constitutional scheme on division of executive powers between the Centre and the states can be made applicable to the Union Territory of Delhi. The Delhi government had accused the LG of making a "mockery of democracy" and said that he was either taking decisions of an elected government or substituting them without having any power.